pigments, 1500 weatherometer and mildew resistant.· Four year limited warranty· Complies with ASTM F1346-91safety standard.· Superior heat sealed 4mil LDPE wrap, and greater craftsmanship create a tighter seal, resulting in a drier core.· No additional charges for most custom shapes and sizes. · Heavier 22 gauge galvanized C-Channel supports extend to nearly the end of the core, giving the cover a greater support structure. 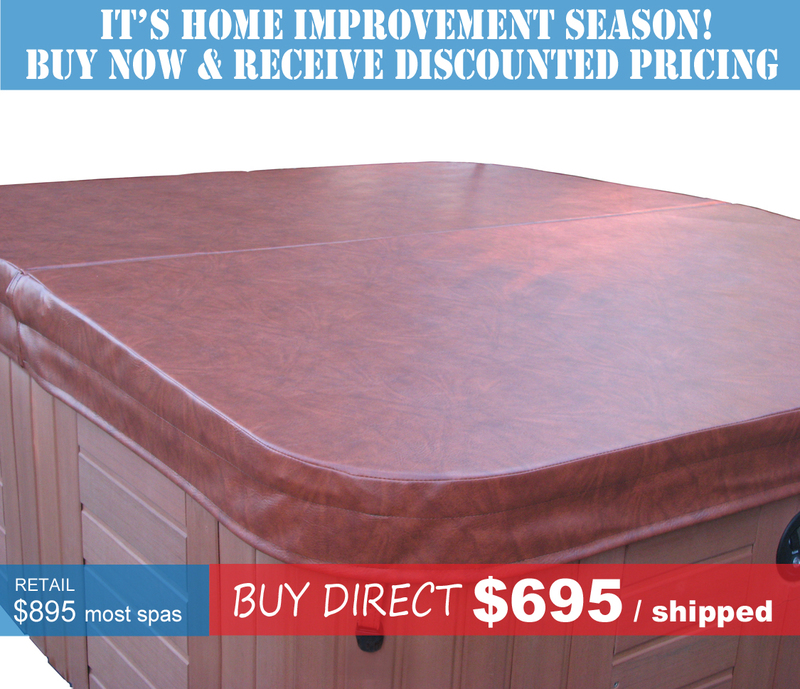 Vinyl Spa Cover Limited Warranty – 4 Year – Vinyl spa covers to a maximum 96” size are warranted to the original retail purchaser for non-commercial use for four years from the date of this purchase. Oversize (over 96”) covers are warranted for 3 years. To Obtain Warranty Service – You must return the cover in a clean and dry condition to the manufacturer with the original invoice as proof of purchase. Sequoiaworks will repair or replace the cover if it is deemed under warranty with no charge for material & labor. Purchaser assumes all costs for delivery or freight charges and disposal costs. This warranty is limited to the purchase price of the spa cover and the manufacturer cannot be held liable for any other incidental or consequential damages or injuries which result from use of this spa cover. What is not covered – This warranty does not cover defects or damage caused by: 1) misuse or accidents; 2) failure to provide proper care and maintenance, see Cautions and Care Instructions; 3) ordinary wear and tear, normal fading and deterioration of vinyl and thread, and seam splitting due to improper handling; 4) snow and ice, animals, fire, vandalism, excessive chemicals, improper installation and strain, excessive abuse or abrasion – including abrasions and penetrations due to cover lifters, alterations, acts of God, or use for purposes other than that for which the cover was designed; 5) broken foam cores, or cores which have been saturated due to punctures, cuts, or other abrasions. Keep It Clean – Clean your cover once a month, more often if needed, with a mild solution of dish washing liquid and warm water and rinse thoroughly. 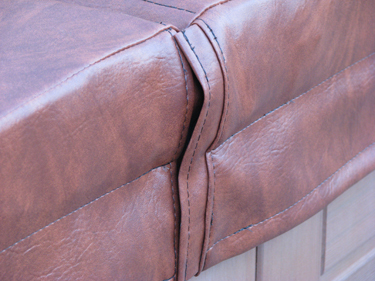 Condition your Vinyl Cover – Use 303 Protectant once a month to condition the vinyl of your cover. This will protect the vinyl and replace the original protectant in the vinyl that the sun and elements strip away. Due to the harsh qualities of many other conditioners, if 303 Protectant is not used, the warranty will be void. Do not use any other brand of conditioner. Do Not Under Estimate the Power of Chemicals – For example, improper chlorine and PH levels can cause damage to your cover and spa. Over chlorination causes burning of the cover bottom material and deterioration of thread. Some color change to the cover bottom material is normal, but excessive discoloring and texture changes are a sign of improper chemical levels and will void the warranty. Proper chemical balance will help prolong the life of your cover. Ask your spa dealer about the proper chemicals for your spa. Avoid Puddles – If your cover develops a puddle on top, you can prolong the life of the cover by unzipping the cover, and removing and flipping the foam core. Be careful not to damage the foam cores’ vapor barrier. Replacement cores are available for purchase.